Sunday, April 26 at 2:30 p.m.
Tickets: $35/$28 Japan Society members. As part of its 2014-2015 Performing Arts Season, Japan Society presents Yokohama Rosa, the second theater production within the Society-wide series Stories from the War, marking the 70th Anniversary of the end of WWII. This represents the North American premiere of this one-woman play conceived by and featuring legendary actress Michiko Godai, which is performed annually in Yokohama on the anniversary of the end of WWII in Japan. Yokohama Rosa is written by the late Giho Sugiyama (1932-2004) and directed by Ichiro Onishi. Artist Michiko Godai first encountered a mysterious old woman frequently seen on the streets of Yokohama, referred to by locals as “Merii-san” (“Madame Mary”), in May 1991. Inspired by her sparkling eyes, Godai set out to explore her story. 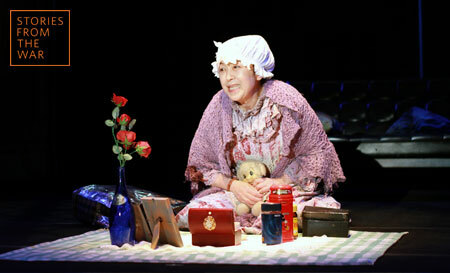 Through interviews with people in town with whom Merii-san interacted, such as bartenders, owners of a local dry-cleaner and cosmetic shop and hair salon employees, Godai pieced together details of her personal history and in collaboration with playwright Giho Sugiyama, created the tragicomedy Yokohama Rosa – a theatrical account of one woman’s story and its dramatic intersection with the events of WWII, the Korean War and the Vietnam War. Yokohama Rosa was first presented in April 1996 in Mitsukoshi Theater (Tokyo). Since then, there have been more than 100 performances of Yokohama Rosa throughout Japan. Since 2003, the play has been performed annually on August 15th, which marks the end of WWII in Japan, at the Yokohama Red Brick Warehouse in Yokohama. This program marks the first time the piece will be performed outside Japan. In Yokohama Rosa, Michiko Godai travels back in time, vividly imagining moments in Merii-san’s life – from her days as a new bride in Hiroshima, to her turn to prostitution to survive in Yokohama, and through her encounters with love and heartbreak and life on the streets. This production features Michiko Godai with Yoko Sugiyama (flute), Hiromichi Sakamoto (cello) and Ken Kuriki (percussion). Performed in Japanese with English subtitles, with live music.